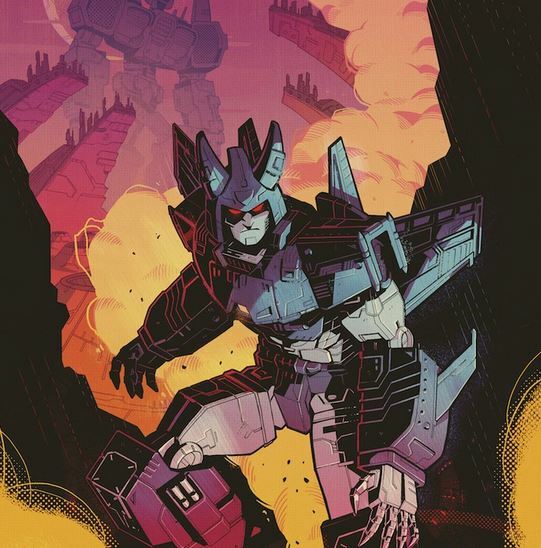 @Anna__Malkova is bringing the goods with this awesome #Cyclonus cover art for Transformers #8! A BOLD NEW ERA OF TRANSFORMERS DAWNS with the premiere issue in March 2019 from @IDWPublishing and @Hasbro! #Cybertron awaits! Lock down pre-orders for the first two issues at your preferred local comic shop and then join in the discussion on the 2005 boards! They’re full sized issues. Cause they’re listed as $3.99. And I mean plenty of comics are biweekly. The current Avengers, Hulk, Batman, to name a few. And they turn out just fine, art and everything. Well that's good to hear. I guess I'm just used to the OP/LL era where the two comics (made by two teams even) seemed to be delayed or having fill-in art every few months. Now the first TPB is said to collect issue…1-12?! Does twice-monthly means very short-sized single issue as well? I've been wondering about this too. Ever since I heard that the comic was going to be twice a month, I was curious about its length. I'd honestly prefer 2 short comics a month to 2 full-length comics that have excessive padding or extremely rushed art. How was Megatron and Galvatron being different guys convoluted in the first place? It wasn't at the beginning. But the constant retcons to Galvatron's character got more and more confusing as time went on. I'm going to assume they're referencing Marvel, where (to my knowlege) it's a bit complex involving alternate timelines. So we doin the whole Megatron and Galvatron are seperate bots thing again? Can we make it less convoluted this time please? I juuuuust noticed that too. The maybe G1 one but that body is definitely looks like the CW one. … I really dislike that CW design. I'm not a fan of all this artwork that's been released so far being fairly slavishly based on a toy. I'm probably on my own but I like my comic-art to look less like the toys and more like their own iterations. My preference if they go that route would be to make Galvatron a Serpentor type created by Shockwave after the Ark/Nemesis disappearance. Serpentor is one of those things that's an awkward fit in G.I.Joe but Shockwave is basically the Dr. Mindbender of TFs. And after Megatron disappears, there's a leadership vacuum. So Shockwave tries to create a composite Decepticon Emperor from the spark traces he can get of past great Cybertronian commanders (including traces of Megatron's spark DNA). But the result is a mad tyrant who is part Megatron but who has other voices in his head. Perhaps including fragments of Unicron. Cyclonus and WB are based off of their last existing toys because no newer Generations toys were made for them. It doesn't mean that Cyclonus must end being a combiner torso or that the new IDW Windblade is a headmaster. It just means that the most up-to-date toyetic designs for them were those. If he's based off his CW design then I'm guessing there's a chance that he'll be a combiner in this universe which is already a cool way to set him apart from the other Cyclonus's aside from the RID15 Cyclonus who was a combiner in that series. I hope he will be a Decepticon. And I hope he will play a role of importance. Also hope Galvatron and Scourge will play a big part and will be portrayed better than in the first IDW series. Cyclonus? Alright! Glad to see it\'s not just about the 84 guys. He looks great. Let's hope they just do one or 2 series and keep things in order and not a ton of different series that overlap with their own numbering system and dozens of one-shots. TMNT was the same way. You shouldn't need a guide to figure out how to read in order. Or at least do what DC used to do (and all comics should do) have a chronological order at the top of the cover, especially when there's a crossover but even when there's not. It makes rereading possible. Even with a guide, Unicron still feels so out of order and like we're missing stuff. Not that it's needed but it feels really disjointed and convoluted. I really did enjoy the IDW TF universe. Especially before All Hail Megs, All Hail Megs, and then again after Dark Cybertron. It was iffy when they tried to force Mask and Visionaries, etc… into it. I'm glad to see classic Cyclonus bunny ears! !